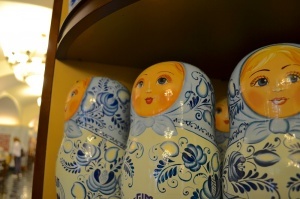 Our Best Short Tour of Russia visits two Russian capitals - Moscow and St. Petersburg. All tours are included! Upon arrival you will be transfered to the hotel. Hotel check-in. Rest after the long flight before your tour of Russia starts tomorrow. The first day of our Russian tour starts with Moscow city sightseeing. Sit back and enjoy the beauty as you drive alongside the historical part within the Garden Ring and Boulevard Ring. Enjoy the excellent views of the Kremlin, Red Square, Kitay Gorod, Tverskaya, Arbat, and Zamoskvorechje and then continue to the the observation deck on the Sparrow Hills, near the Moscow University skyscraper built in 1953. The view beneath the skyscraper offers the best panoramic view of the city. In the morning we visit the Red Square, Kremlin and Armory. You are surrounded by the golden domes of St. Basil’s Cathedral, the State Historical Museum, the elegant arcades of the GUM department store, and other landmarks around the Red Square. 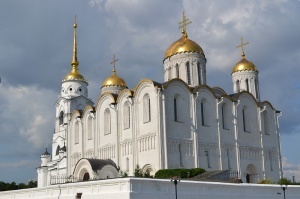 Inside the Kremlin we explore the three Cathedrals of the Assumption, Annunciation and Archangel, which date back to the 15-16th centuries, Ivan the Great Bell Tower, Tsar Bell, Tsar Cannon, Hall of Facets, and Terem Place. The Armory boasts a stunning collection of treasures including royal regalia, Faberge eggs of precious metals and jewels, the 800-diamond throne of Tsar Alexey, the jewel-studded and sable-trimmed gold Cap of Monomakh, the coronation dresses of 18th century empresses, and the sleigh that was led by 23 horses in which Elizabeth rode from St. Petersburg to Moscow for her coronation. The official residence of Russian presidents the Great Kremlin Palace is part of the Kremlin ensemble. Today you will tour one of the most amazing and efficient subway systems in the world - the Moscow Metro. Over twenty kinds of precious stones and metals were used in construction of these "underground palaces", decorated by statues, bareliefs, and monumental compositions. Architects and builders of Moscow underground aspired to create not only comfortable conditions for passengers, but also to give an individual shape to each station. In the afternoon we will visit the Tretyakov Gallery, one of the most celebrated and extensive collections of Russian art and artifacts in the world. 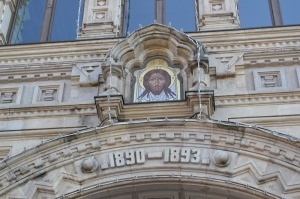 It is located in Zamoskvorechye - one of the oldest districts of Moscow. The collection contains more than 130,000 masterpieces of Russian art created throughout the centuries by many generations of Russian artists. In the evening we will transfer to the train sration and take a fast train to St. Petersburg. 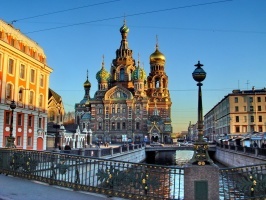 Our driver will meet you in St. Petersburg and transfer to the hotel. We will start St. Petersburg sightseeing tour right after breakfast. One of the most mesmerizing cities in the world, St. Petersburg is full of excitement and is sure to please visitors of all backgrounds and ages. You’ll have the opportunity to view remarkable sites such as the Palace Square and the Winter Palace situated along the Palace Embankment on the Neva River. You’ll also see the Bronze Horseman, Alexander Column, and the famous Peter the Great monument. Other landmarks include the famous Church on Spilled Blood, St. Isaac’s Cathedral, Schmidt Bridge, Alexander Nevsky Lavra, Fontanka, Admiralty, Peter and Paul Fortress, Strelka with the Stock Exchange and Rosstral Columns, Canal Griboyedova, and the Kazan Cathedral as well as many other top tourist sites. You will also get a chance to explore St. Isaac’s Cathedral and Peter and Paul Fortress up close on the tour. Though the Peter and Paul Fortress was built to defend the city from naval attacks in 1704, it never served its purpose. Thousands of laborers who helped to build the fortress died and some political prisoners, like Alexi (Peter’s own son), were held and tortured in the cells here. 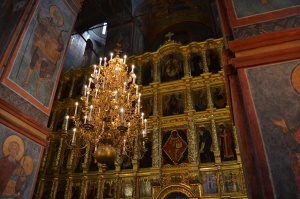 The tombs of the Romanov family are also in its Cathedral. In the morning enjoy a tour to Pushkin. 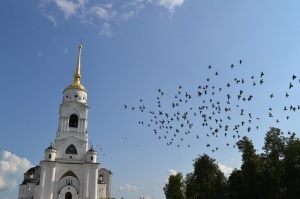 The town is located 25-30 km from St. Petersburg. Pushkin's palaces and parks were created under Empresses Elizabeth and Catherine the Great between 1744 and 1796. 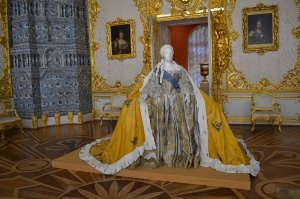 The main landmark is the Catherine Palace designed by Rastrelli.Amber Room is part of Catherine Palace exibition. Pushkin's original name is Tsarskoye Selo (Tsar's Village). It was renamed in 1937 after Russia 's famous poet who used to study here. In the afternoon visit Petergoff (formerly known as Petrodvorets), located on the southern shores of the Finnish Gulf, 14 miles away from St. Petersburg. The Grand Palace with its lavish interiors, gilded decorations, mirrors and paintings dominates the estate. The Park outside the Grand Palace is a kingdom of 144 unique fountains, all operating without the use of pumps by a combination of naturally generated water pressure and magic. Walking in the parking you will be amazed by the splendid beauty created by a man. Located along the embankment of the River Neva, the Hermitage Art Museum is one of world's most popular art destinations. Your tour will take you through this remarkable structure designed and built in mid-18th century by the famous architect Francesco Bartolomeo Rastrelli. The Winter Palace was at one time the residence of the Russian tsars and extends out into the eastern wing of the General Staff building, the Menshikov Palace, and the most recently constructed section in the Repository. The Hermitage is home to magnificent collections of art work (over 3,000,000 items) starting from the Stone Age up to the 20th century. After the tour, you may continue to explore the Hermitage on your own, or you can head over to the Nevsky Prospect for a bit of leisure time or shopping at your own pace. It was great trip! Thank you!